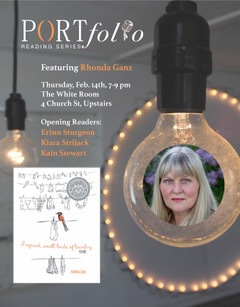 Join us for the Portfolio Reading Series’ monthly literary gathering at Nanaimo’s hip White Room, upstairs at 4 Church St downtown, and featuring Victoria's Rhonda Ganz, reading from her debut poetry collection Frequent, Small Loads of Laundry. In her debut collection, poet Rhonda Ganz brazenly mixes darks with lights and pegs the quirky and bizarre, both real and imagined, with all the seams showing. From spontaneous combustion to suicide, from psychopaths to pterodactyls, Ganz is obsessed with the way people behave in moments of intimacy and domesticity. With her sharp wit and painterly abstractions, she pairs the banal with the absurd to expose the flaws of love—the frayed edges of belief and despair. Strung up, these poems are an authentic clothesline of hearsay, fabrication, doomsaying, and half-truths. Crime fiction, reality TV and bad dreams inform Rhonda Ganz’s poetry, which has appeared in Rattle, The Malahat Review, Room, on city buses and in the anthologies Rocksalt: An Anthology of Contemporary BC Poetry, Poems from Planet Earth, Poet to Poet and Force Field: 77 Women Poets of BC. A poem of hers was chosen by Harvard Design Magazine for their December 2015 issue “Shelf Life.” She has been a featured reader at Planet Earth Poetry in Victoria, WordStorm in Nanaimo, Word on the Street in Vancouver and at the inaugural Galiano Literary Festival. Rhonda Ganz was born in Kenya. She lives in Victoria, B.C., where she works as a graphic designer and editor. She shares a home with one human and varying numbers of cats. She speaks German and can hold a conversation in Swahili. She has been known to write poems on the spot for people in hotel lobbies, parks, and cemeteries. "There has never been a poet like Rhonda Ganz. What a magician of words she is, what sleights of narrative she performs. The pleasure for the reader is unending, no matter how many times you roll these poems off your tongue. There’s such brightness here, such wry humour, such serious whimsicality. If this is what laundry looks like, the wind couldn’t be happier and I want some on my line.”–Lorna Crozier, author of The Blue Hour of the Day and What the Soul Doesn’t Want. "Rhonda Ganz’s debut collection of poetry is breathtaking, refreshing, direct, oblique. This is not your ordinary first collection of poems; there is nothing standard here. These poems are smart, sassy, quirky, scary—and funny. They are absurd; they are real to the bone. These are small—and not so small—perfect poems. Read this collection for its haunt of the surreal; read it for how it plumbs the truth.”–Arleen Paré, author of He Leaves His Face in the Funeral Car and The Girls with Stone Faces.